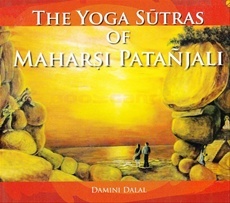 The Yoga Sutras of Maharsi Patanjali Have been composed between 300 BCE TO 300 ACE. They are most versatile and comprehensive aphorisms that even today we seek answers to life and a way of living through them. The 195 sutras are divided into four chapters called pada: samadhi pada (on concentration and Enlightement ), sadhana pada(path of action and purification), vibhuti pada ( Transcending the Elements ) and kaivalya pada (Transformation and Enlightenment ). This beautiful booklet is a daily treasure to enable easy recitation and learning of the sutras,ponder over their meanings and to bring about a resolve of self- transformation.